The giant Candy-Bar Wall in the Royal Kitchen is used to store. . . well, candy bars. These are placed in jars on N equal-length shelves. The shelves are positioned in a vertical progression from the ground up, and perfectly aligned horizontally on their rightmost and leftmost edges. Each shelf is partitioned into M equal-sized slots, which can either be empty or occupied by a jar. A jar contains between 1 and 9 candy bars. Every shelf is connected to the one directly below (or to the floor, for the bottommost shelf) by one or more vertical ladders. A ladder connects a slot to the corresponding slot on the shelf below, or to the floor. There is at most one ladder directly under any given slot. while of course grabbing as many candy bars as possible during this trip. The major issue the bandit faces however is that he cannot enter a slot containing a candy jar more than once, since this would trigger a dreadful Candy Alarm. Your mission: help the bandit carefully plan his round trip across the Candy-Bar Wall so as to maximize the number of candy bars he grabs, without triggering any alarm. Line 2k, for 1 ≤ k ≤ N, comprises the characters ‘-’, ‘1’, . . . , ‘9’, where a digit x represents a jar containing x candy bars, and ‘-’ denotes an empty slot. Line 2k + 1, for 1 ≤ k ≤ N, comprises the characters ‘.’ and ‘|’, where ‘|’ represents a ladder, and ‘.’ means empty wall space. there are between 1 and 10 ladders directly under any shelf. The output consists of an integer on a single line, representing the maximum number of candy bars the bandit can collect without triggering any alarm. Slots corresponding to ladder endpoints may contain jars. 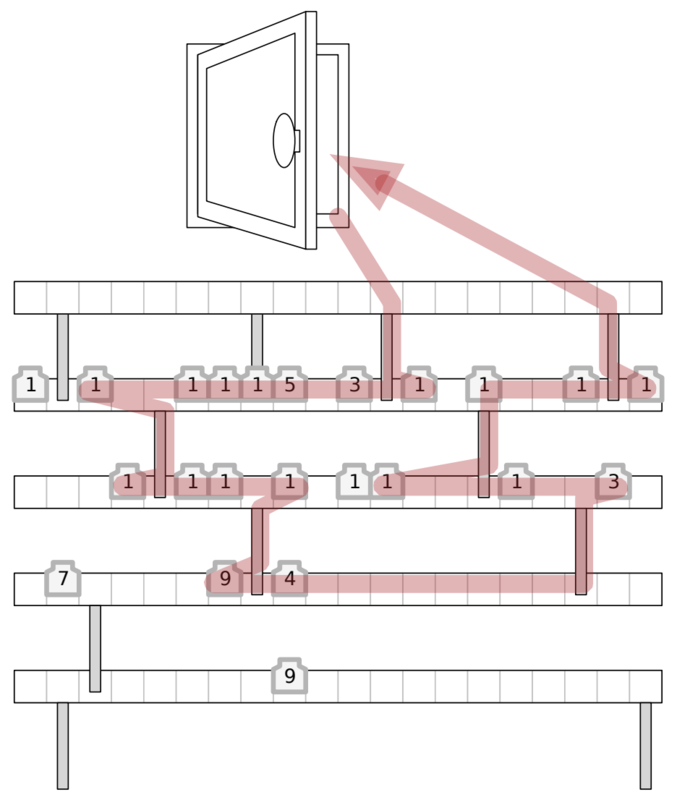 A slot may be entered either by walking (left to right or right to left) on a shelf, or by reaching the endpoint of a ladder. Slots corresponding to a ladder’s endpoints are necessarily entered if the ladder is used. There are no candy jars on the topmost shelf and on the floor.